Just in time for Christmas, the January–February 2018 issue of the Harvard Business Review offers us a lump of coal in the form of an article entitled The Case for Plain-Language Contracts (here). It’s by Shawn Burton, general counsel of GE Aviation’s Business & General Aviation and Integrated Systems businesses. It describes “a three-plus-year effort to promote plain-language contracts at GE Aviation’s digital-services business.” That effort started in 2014. The premise is unobjectionable: “For the most part, the contracts used in business are long, poorly structured, and full of unnecessary and incomprehensible language.” Sure, using clearer language in contracts allows you to save time and money, be more competitive, and avoid assuming unnecessary risk. And no doubt overhauling the contracts used by GE Aviation’s digital-services business yielded many benefits. 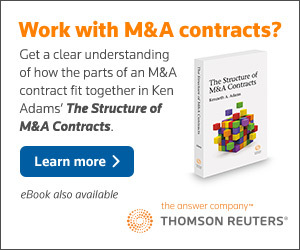 But as a guide to how to make business contracts clearer, this article ill-informed. First, the article is unrealistic in the standard it sets: “If a high schooler can’t understand the entire contract, it ain’t good enough.” Contracts are necessarily as complex as the transactions they express, and plenty of transactions are complicated. Perhaps the transactions that GE Aviation’s digital-services business enters into could indeed be understood by a high-school student, but it’s misleading to suggest that that standard could be applied broadly. I discuss that in this recent blog post. Furthermore, it appears that the resulting template clearly flunked the high-school-student test in at least one respect, as I discuss below. Second, the article lumps risk assessment and relevance in with clarity. The starting point for Shawn’s initiative was seven templates. The average length was 25 pages; the longest was 54 pages. Boiling them down to one five-page contract must have involved cutting provisions wholesale. That goes beyond saying stuff clearly. Burton [then general counsel of Digital Solutions] harked back to his law school days when he studied Plain Language, a way to condense the written word to the clear basics. He dusted off his textbooks and, with the help of his GE language commandos, used it to write a new contract. During the contract term, we will comply with all of our legal obligations. Leaving aside use of the first person and, it follows, use of will to express obligations, I suggest that “During the contract term” is expendable: unless it’s specified otherwise, a contract provision necessarily applies only during the term of the contract. (For more on that, see MSCD 13.254 or this 2007 blog post.) And “all of our legal obligations” appears to be an awkward way of saying you’ll comply with the law. 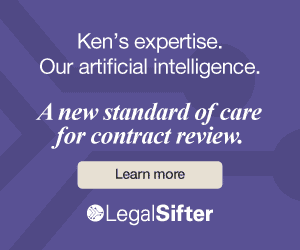 For one thing, the word obligations is so associated with contracts that some readers might assume that this sentence refers to contract obligations. “Your and our total compensation obligation”? What a wretched buried-verb combo! See MSCD 17.7. Say instead something like “Neither of us is required to pay”. Does “Your and our” mean that the limit applies to the aggregate of the, uh, compensation obligation of both parties? Or does it apply to each party’s compensation obligation considered separately? Why “cannot exceed”? The word cannot expresses physical or mental inability; that’s out of place here. See MSCD 3.293. As always, the question is, What category of contract language should this be? See MSCD chapter 3. Why use words to state these numbers? See MSCD 14.1. So the GE Aviation entity is referred to using both “FES” and the second person (“our”)? A basic rule in contracts is that you shouldn’t say the same thing two different ways, as that invites confusion and gives the reader more work to do. Using “including, but not limited to,” is a bad idea. See MSCD 13.353 or my recent article with Vice Chancellor Laster of the Delaware Court of Chancery, When Contracts Seek to Preempt Judicial Discretion (here). Regarding “consequential, punitive,” and so on, any high-school-student exposed to that would be rendered a gibbering wreck. Such limitation-of-liability incantations are a strong candidate for most-misunderstood contract provision, commercial-contracts category. I recommend doing something different. See MSCD 13.161 or this 2010 blog post. Shawn’s article says that the law firm Weil vetted the new template; it so happens that Glenn West, a Weil partner, is author of the article on the pitfalls of the standard “consequential damages” litany (here). Black’s Law Dictionary says “exemplary damages” means the same thing as “punitive damages”: why include synonyms in the litany? The “after” version is described as “clearer and much more concise.” That’s not so—instead, it’s entirely different! The provision it replaces is a clunky indemnification provision that in effect says that the customer will be liable if various matters arise, regardless of whether the customer was somehow at fault. The “after” version just says that the breaching party will be liable for breaches. Why bother saying that that the breaching party will be liable for breaches? 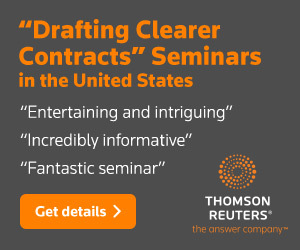 That’s the way contract law works, whether or not you say so in a contract. Use of the term “non-breaching party” can have unintended consequences. See MSCD 2.123. Using such instead of those is a hallmark of dysfunctional traditional drafting. See MSCD 13.179. Using a capital S in the word section in cross-references is inconsistent with the recommended practice in general English usage. See MSCD 17.34 and The Chicago Manual of Style. The moral of this story is that optimal contract language requires more than enthusiasm. “Better” is easy; “best” requires serious application. If that weren’t the case, I’d feel a bit of a chump for having devoted much of the past 20 years to researching the building blocks of contract language. So I find myself in the unusual position of taking issue both with traditionalists (most recently in this post and this post) and with people who think they’re at the forefront of the push for clearer contracts. In both contexts, my message is the same: contract language is tricky, and a lot is at stake, so for optimal contract language you need standards. That I’m the author of the only comprehensive set of guidelines out there—A Manual of Style for Contract Drafting—doesn’t mean I’m writing this in a fit of pique. Promoting one’s ideas requires pointing out the shortcomings in other ideas, particularly when they’re broadcast from atop a soapbox as prominent as the Harvard Business Review.